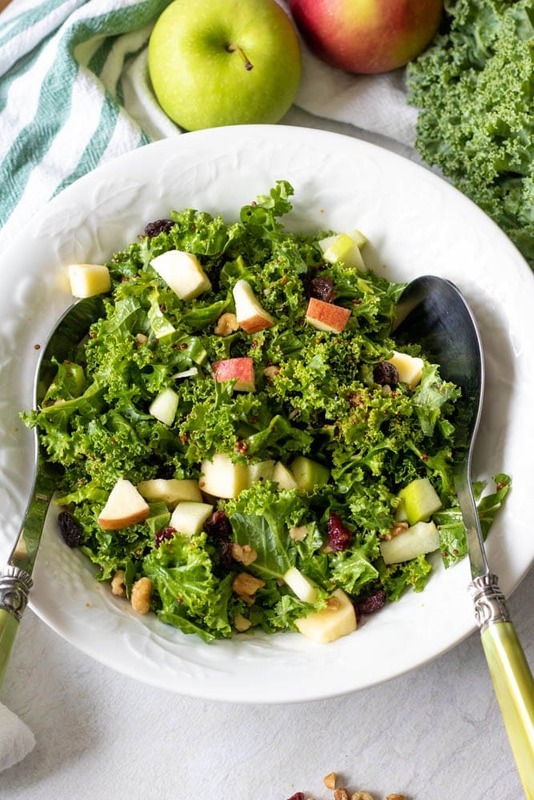 Kale Salad with Apples and Homemade Maple Mustard Vinaigrette: A simple salad with a sweet and tangy dressing massaged into fresh kale and then tossed with apples, raisins, and walnuts. Kale Salad. People either love it or hate it. In my opinion, if you hate kale salad, you only THINK you hate it! It is all about how you treat the kale leaves that will make you a believer in a salad made with Kale. Kale has a reputation of being very tough and bitter. But there is a secret to preparing kale that will make your kale salads tender and full of delicious flavor. It is all about massaging your kale. Yep, you heard me right, MASSAGE the kale. Get in their with your hands and rub the dressing into the leaves. This will help to break down the tough fibers of the kale leaves and allow the kale to absorb the flavors of the dressing. Now that you know the trick to making a good Kale Salad, it is time to actually make this Apple Kale Salad. Step One: Prepare your Kale. Remove the thick stem from each stalk of kale and then roll the kale leaves up and chop into bite size pieces. Kale pairs perfectly with a sweet and tangy dressing. And a mixture of maple syrup and Dijon mustard is good on almost anything. Pour your dressing over the kale salad and then using your hands, rub the dressing all through the kale. Another tip to a great kale salad, is to allow your kale to sit in the fridge for several hours to marinate in the dressing. This further helps to break the kale down and flavor it. Sprinkle the salad with chopped apples, raisins, dried cranberries, and chopped walnuts right before serving. Kale is high in fiber, Vitamin K and Vitamin, Calcium, and in Iron. These vitamins are essential for bone health and liver health. Kale is full of nutrients that help your body detox unwanted toxins and keeps your brain sharp. It is also known to help prevent cancer. Those facts alone should have you rushing to try this salad, never mind the fact that it is delicious. This salad is a great way to enjoy this super food. Just don’t forget my secret to getting those kale leaves nice and tender. 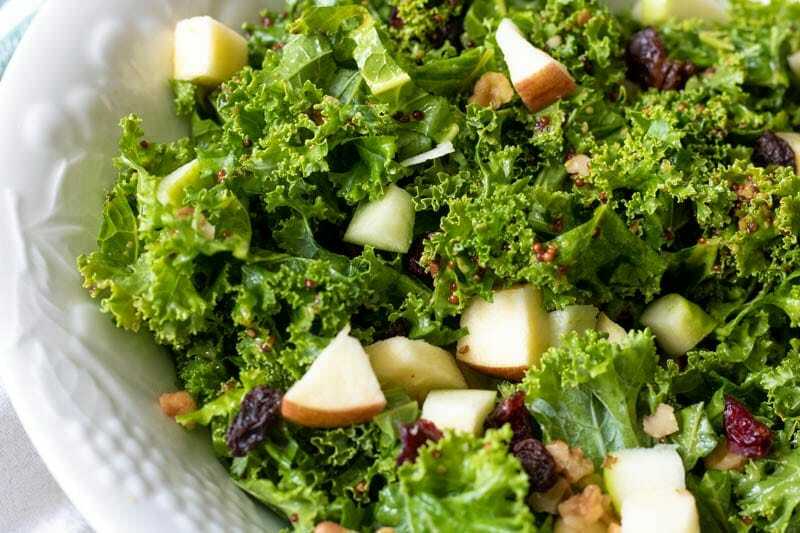 Apples, walnut, cranberries and a maple dressing are tossed together with kale. Mix together the vinegar, oil, mustard, and syrup and season with salt and pepper to taste. Remove the tough stem from the kale and chopped into bite size pieces. Add the dressing to the kale and massage into the leaves. Yes, rub that dressing into those leaves. It will cause the kale to infuse with flavor and be easier to digest and softer to chew over time. Refrigerate for 2-8 hours and then before serving toss with the walnuts, apples, raisins, and craisins. Top this salad with any dried or fresh fruit you like. If you are not vegan, this salad is delicious with chunks of cheddar cheese as well. Omit nuts to keep this salad nut free. wow… I’ve never thought of this combination!!! I’ll definitely try this!!! I hope you enjoy it–it is one of my favorites! Maybe I need to massage my kale more! I’ve grown it for the last few years, and I can never find enough things to do with it! Massaging it adds so much flavor! I love to add it to eggs, soups, and make pesto from kale as well. This salad looks amazing! Can’t wait to try it! I love this kind of recipes – looks so fresh and delicious!! Fresh and delicious is right! I’m totally one of those people that loves kale!! Your my kind of gal!